Traditionally, Bodhidharma is considered as the founder of the Buddhist school Chan (also known in Japan and Occident under the name of Zen) but also of the Shaolin Quan or « Shaolin Boxe » school. This word includes all Martial Arts which were born in the various Shaolin Monasteries. Some styles belong to a large set of Chinese Martial Arts (Wushu Gong Fu). The Shaolin Quan has spread all over Asia to be transmitted under different forms. It is in Japan, in the archipelago Ryūkyū, and more specifically in Okinawa, that the most famous form of Kempo will be known under the name of Karate. 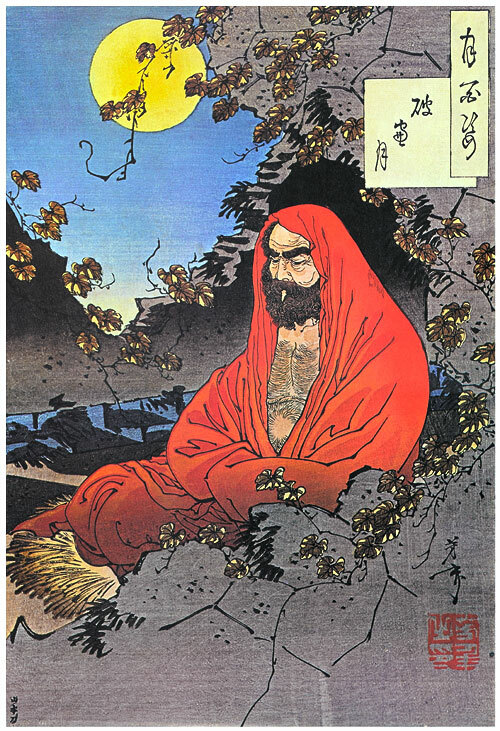 Bodhidharma (Chinese: Putidamo, Pinyin: Pútídámó, Japanese: Bodaidaruma or Daruma and Tibetan: Dharmottara) was an Indian monk, who is believed to have lived at the end of the 5th or beginning of the 6th century. One mystery floats over him, as in reality, there was only one eye witness Yang Hsuan-Chih, resident of Lo-yang, named nowadays Honan. The story he wrote in 547ac was called Lo-Yang Chia-Lan-Chi (Annals of mountains and monasteries of Lo-yang). Bodhidharma was described as a strange man with clear skin, bushy beard and with fiery eyes, dressed like a southern barbarian (Nanman). 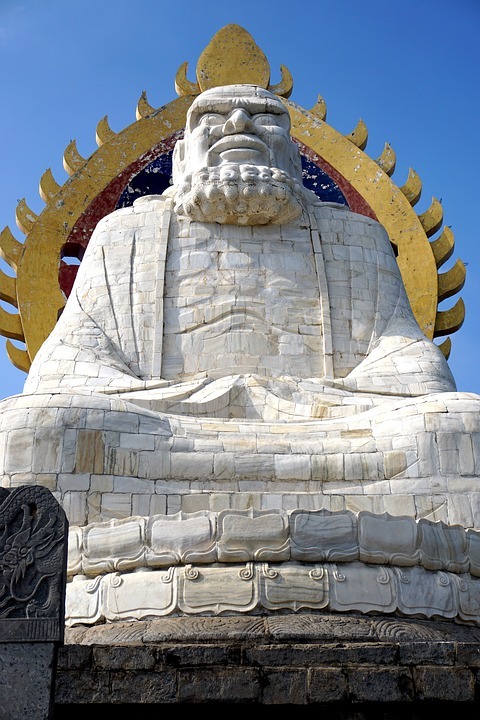 According to Yang Hsuan-chih, he was the oldest son of King Sughanda, descendant of Buddha. Therefore, he was the 28th patriarch of Buddhism. His trip is recorded into the Chinese chronicles from 543ac. Coming all the way India, he requested to meet the Emperor Wu of the Liang dynasty (Liang Wudi or Leang Wu Ti), known protector of Buddhism in China. Through his discussion with the Emperor, he could explain that in spite of his efforts and all the good deeds he had accomplished, he hadn’t received any recognition. According to Bodhidharma, the only conceivable merit laid in the immediate and mystical knowledge of the nothingness of all things. In a word, temples, golden statues, the pious illustrations, ceremonials, gifts so all the depictions of Buddhism in China meant nothing compared to the quest to reach the “Awakening”. Meditation is the only way to achieve this goal, called Dhyâna. 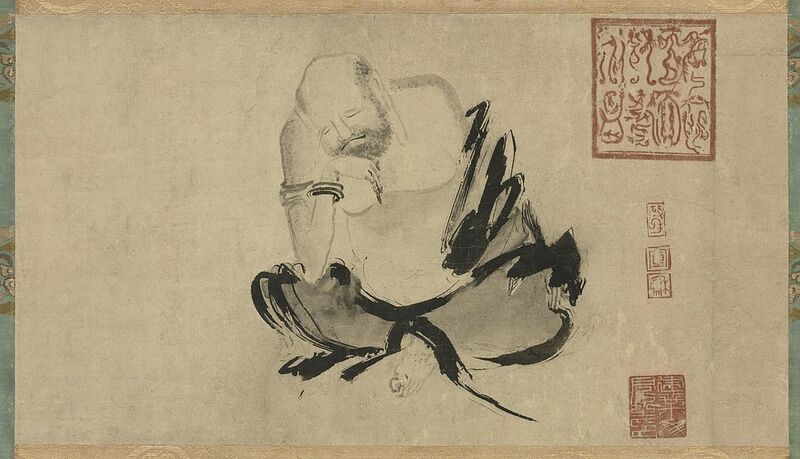 Bodhidharma, literally The Enlightened One, was actually suggesting a new conception of Mahâyâna Buddhism and questioning an entire moral, philosophical and religious system to which Wu had devoted his whole life. The Emperor considered this revolutionary conception as a blasphemy and didn’t accept this proposition; as a consequence he dismissed Bodhidharma. His life was only spared because he was the disciple of Prajnâdhara (27th patriarch). In 520ac, he tried to find shelter in the most famous monastery of the time, Little Forest or Shaolin Shi. Unfortunately, the monks didn’t grant him the right to enter their sacred territory. Bodhidharma, then, sat down and started to meditate for nine years while fixing the temple walls until holes were carved. Considered as a miracle, he gained the respect of the monks who let him in. To his surprise, he uncovered their awful physical conditions. The lack of vigor was the result of many hours spent transcribing old sacred texts and meditating. He came to the conclusion that the journey to reach Satori, through Zen, couldn’t be taken without taking good care of body and therefore only the perfect union between mind and body could allow it. In this context, he decided to design some exercises in order to develop muscles including a large diversity of techniques mainly based on the use of punches. This form of fighting, spread in the whole country, was inspired by Indian war methods to slow integrate the local techniques to become the starting point of various Shaolin Quan schools. He passed on his dogma to Hui-Ke, considered to be the second patriarch of the Chinese Buddhism from the monastery of Shaolin-Si. A legend is the rewriting of historical facts using symbolic, allegoric and poetic skills. The oral or written transmission of a legend follows philosophical, religious, moral and ethical variables which vary though time. Furthermore, translations into occidental languages could lead to other mistakes. Even if consider the translation to be faithful, what is its meaning? Which language did Bodhidharma use when he has communicating with the author? Was he a fluent Chinese speaker? Did he really mean to say he was 150 years old? If so, was Bodhidharma declaring what he thought to be the truth, or was he using enigmas, as later on the Ch’an and Zen monks? In 1928, all archives stored in the Shaolin monastery burnt in a fire. It is then, not really conceivable, to ever find new documents to prove that Bodhidharma deserved his place as patriarch of ch’an, zen and martial arts. However, the modern martial arts show the evidence that these teachings have really survived.